Laura is an avid traveler and outdoor enthusiast, and has spent much of her life in the mountains skiing, hiking, and biking. She has been inspired and influenced by cultures globally, but always appreciates coming home, and continues to be amazed by the pacific northwest. Laura completed her undergraduate degree at Trent University in cultural and indigenous studies before moving to Revelstoke to spend her time ski touring and working as a support worker for individuals with developmental differences. This work lead her to become passionate in health care, and she decided to head back to school to become a nurse. Laura graduated from UBC in 2018 as an RN, and it was during this period that she moved to Nanaimo with her partner to pursue her passion for maternity and outreach nursing. 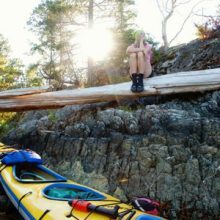 Now calling Vancouver Island home, she is eager to continue kiteboarding and surfing as well as discover all the new adventures the coast has to offer.